What, exactly, do the new teacher contracts that ended a summer of chaos mean for the financial future of Washington's school districts? 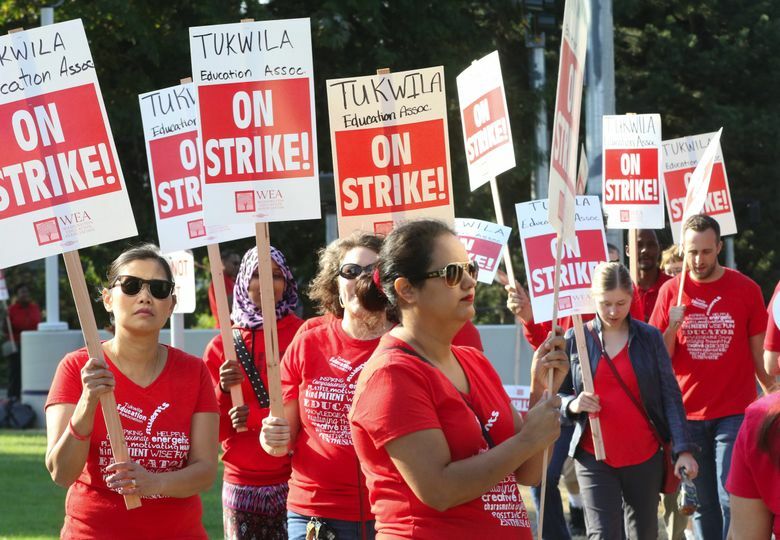 In 13 districts across the state, teacher strikes delayed the start of school this year; potential walkouts that never materialized threatened to do so in eight others, including Seattle Public Schools. And even though most Washington students have returned to school, the double-digit pay hikes approved this summer have set many districts and their unions on a collision path with the state Legislature next year: Without more money from lawmakers, they won’t be able to afford the raises they promised — at least not beyond this year. Here’s what you need to know about what, exactly, this moment of relative quiet means in the scheme of school districts and their financial stability. What was the deal that ended the strike in Tacoma? The Tacoma School Board still needs to approve the tentative contract, but if it does, starting pay for teachers would rise from $45,500 to $54,308 — a 19 percent boost. The maximum salary, meanwhile, would top $108,520, up 16 percent from about $90,900 currently. The deal also includes overall increases of 14 percent and 19 percent for professional-technical employees and office professionals, respectively. “We will offer among the most competitive salaries in the Puget Sound region and retain our advantage to attract and retain the best educators,” Tacoma Public Schools said on its website. The district and the Tacoma Education Association, which represents teachers, announced the deal late Thursday but kept details under wraps until 99 percent of union members who attended a meeting Friday voted to ratify the contract. How do Tacoma teachers feel about their new contract? “It’s a good contract. Everyone benefits,” Ann McPartlon, a special education and math teacher at Foss High School, said late Friday. She noted the deal, similar to one educators in Seattle ratification last week, included raises beyond just senior teachers. At Friday’s meeting, union officials told members that the contract deal would bring Tacoma’s salaries for teachers into the top three among neighboring districts. Lucie Kroschel, a humanities teacher at the Tacoma School of the Arts, posted on social media that she cried after the vote. In Tacoma, the union’s blessing ended a seven-day strike that delayed the opening of school. Classes are set to start Monday. Schools are due to reopen Tuesday for 6,800 students in Tumwater; on Monday morning, teachers approved the tentative agreement their union reached with the district. In Battle Ground, more than 13,000 students are starting school Monday, after teachers voted a day earlier in favor of a last-minute deal with their district. Gov. Jay Inslee, who on Friday was in San Francisco for a global climate summit, had said he planned to call the local unions and district superintendents who were still mired in disputes over pay. It wasn’t immediately clear whether his efforts helped end those conflicts. How will districts be able to pay for these new raises? Inslee and state lawmakers likely will hear from a united front of districts and teachers next year: Already, officials in Seattle, Edmonds and Spokane have forecast years of painful budget crunches if they don’t receive more money from the state to cover their now-higher teacher salaries. While eight lawmakers who represent the Tacoma area have pledged to find some solution during next year’s legislative session, some Democrats and Republicans have suggested there’s no appetite in Olympia to offer districts a lifeline if they approved unsustainable budgets. Seattle Times staff reporter Joseph O’Sullivan contributed to this report.